Data recovery situations vary depending on the loss scenarios. Each data type can be potentially lost, as can reminder. However, the difference is that some people have backups while others don't. Just like Abigail reported, looking for way to recover deleted iPhone reminders from iTunes is also a concerned issue. Now in this article, we will concentrate on this topic and show solutions in a clear manner. What is known to us all is that aside from "Check for Update" and "Restore iPhone" options, iTunes also functions to back up iPhone data and restore them whenever you need. As long as you synced important iPhone data, like your deleted reminders, to iTunes before data loss, you are entitled to get them back with following steps. Step 3: Check all iTunes backups and opt for a recent one that likely contains iPhone reminders; click on "Restore" button to start to recover. Note: As you can see, this method is pretty straightforward and easy-to-handle. Nevertheless, you ought to bear in mind that it will replace your current reminders data on iPhone with the recovered one and gives no access to preview detailed files before retrieval. Joyoshare iPhone Data Recovery is a well-liked iOS data recovery software that does well in recovering data files from iTunes and iCloud backups. There are up to 20 kinds of supported iOS data, such as reminders, photos, videos, call history, Safari bookmarks, notes, Kik/Viber/WhatsApp attachments, etc. 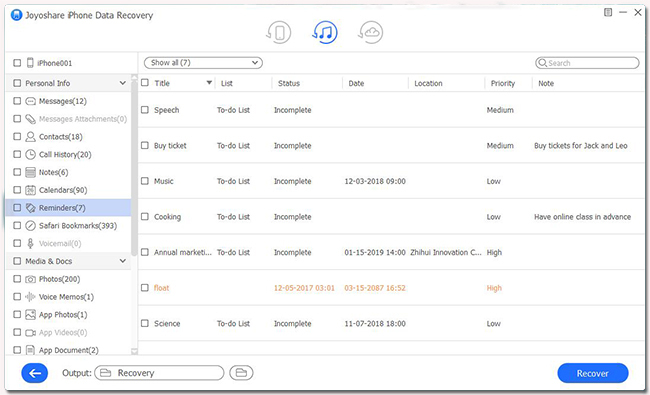 Gratefully, its flexible and versatile solution enables you to preview recoverable reminders in real time and choose items selectively at your disposal before initiating a recovery task. 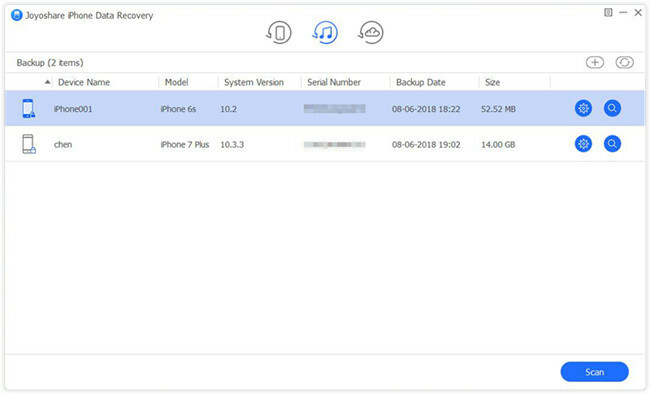 All that matters is Joyoshare iPhone Data Recovery can supports restoring files from both common and encrypted iTunes backups. It works efficiently to decrypt iTunes at super-fast speed. 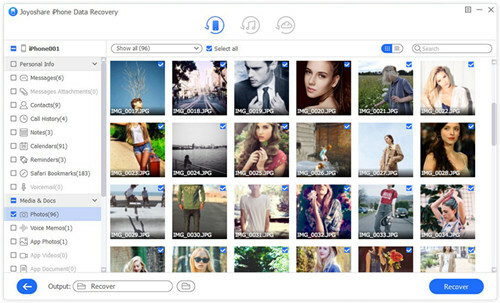 This third-party data recovery tool, Joyoshare iPhone Data Recovery, can serve as a medium to protect your iPhone data. 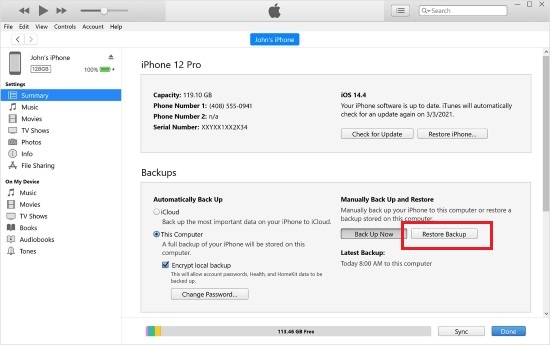 It comes with both Windows and Mac versions; now we are going to show you quick guide to undelete iPhone reminders from iTunes backup on Windows. Get this Joyoshare iPhone iTunes backup extractor started on your PC. Go ahead to its top navigation bar to switch recovery mode as "Recover from iTunes". Shortly after, Joyoshare iPhone Data Recovery will automatically detect and display all iTunes backups in a list for your reference. To import an extra iTunes backup from your local folder, you can smartly utilize the "+" button. Or "Refresh" the list in your own way. According to the related info, select the most relevant iTunes backup and confirm data type by pressing its "gear" icon. Click "Scan" button and enter encrypted passcode to start scanning process. 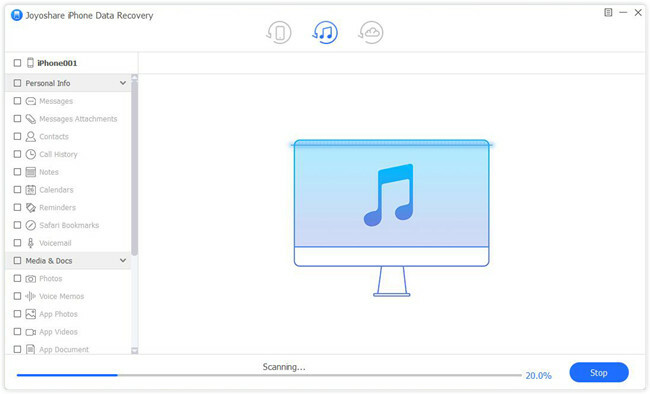 It will take you a while to complete iTunes backup scanning process. Afterward, all recoverable contents will be classified in different categories. Go to "Reminders" to preview items you would like to restore. Get them marked and save to computer with the "Recover" button.